I've stayed away from talking about our misadventures in the Middle East this past couple of weeks, for one simple reason. It's a humungous bummer, man. How's a traitorous pinko supposed to enjoy the abject defeat of our evil leaders when all these innocent people keep getting slaughtered? Still, as Larry notes, fervent warfans are still prone to fatuous historical analogies, and seldom miss an opportunity to castigate us commies for our ignorance. I'm always enraged by this, since I'm a well-read chap, so I thought I'd offer President Bush the benefits of my vast historical knowledge in planning the next phase of his righteous battle against evil. First, always deploy your cavalry on the flanks, to prevent attacks from the rear. Keep at least two units of veterans in reserve, and commit them at the critical moment. Keep your poorest units closest to the enemy, and the enemy will most likely waste their arrows on poorly trained troops. Always keep to the high ground, and if your enemy has superior numbers of archers, you should attack them with infantry as quickly as possible. If fighting against war elephants, train your troops to avoid them by making channels in their ranks. Beware Greeks bearing huge wooden horses, they're probably filled with soldiers. Never embark on a land war in Asia, and only invade Persia if your name is Alexander. Never invade Parthia, or you'll be drinking molten gold for breakfast. 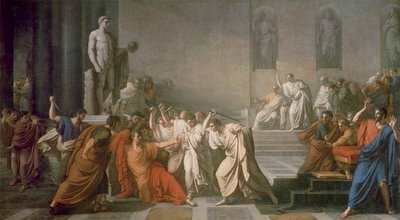 Oh, and beware the Ides of March. And to think, the warbloggers say us lefties don't understand the military mind! I think I should be given command of British forces in Basra, a bit of crucifixion would soon quiet down the natives.